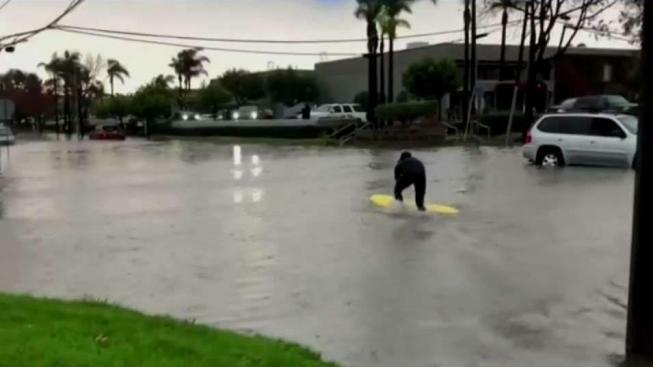 The second storm in a week dropped record-breaking rainfall on a parched Los Angeles Thursday, jamming traffic on Southern California highways and sending an airliner skidding off a runway, but no major injuries were reported. The storm provided a big boost in and around Los Angeles. According to NBC4 meteorologist Anthony Yanez, rain amounts ranged from half an inch to nearly 4 inches with snow at 6 inches and counting. Normal monthly rainfall for December is about 2.33 inches. Mandatory evacuations were ordered for hundreds of homes in Trabuco Canyon in the Santa Ana Mountains south of Los Angeles and Lake Elsinore neighborhoods in Riverside County. Both were burned in another massive wildfire earlier this year. Video showed a churning, muddy torrent full of downed trees taking down a bridge guardrail. In San Diego County, flooding forced hundreds to evacuate from a temporary homeless shelter in the East Village as rain water inundated tents and swamped dozens of portable outdoor bathrooms. A shelter resident told NBC San Diego that the little he had of personal belongings were lost in the flood. "I served two years in the Army. I’m a vet. I’m strong. That’s the way I was trained. I will move on from this," he told the station.